Time to empty your pockets on this extraordinary gold bike, A real pot of gold. 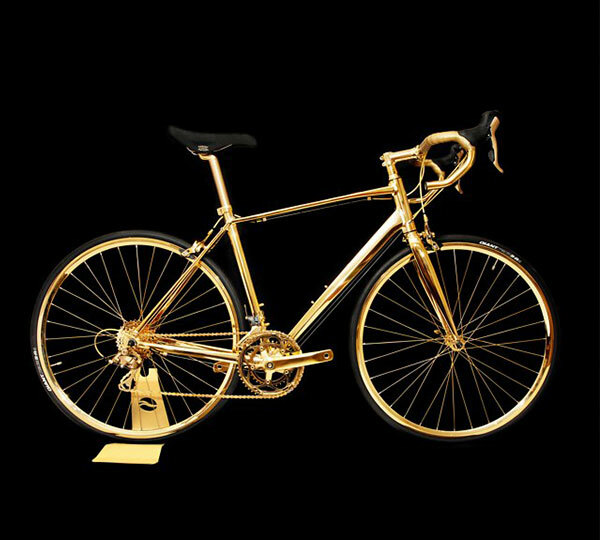 This 24k Gold Racing Bike glorious model comes complete with a limited edition soft San Marco suede saddle and SR4 racing tires. A rather marvelous team of customization artisans have only gone and embellished this men’s British racing bike with 24K Gold. The specialists meticulously applied a lustrous layer of 24k gold to entire structure of the bike, from the tip of the drop handlebars to the wheel stays, and every other part in between, including every ridge of the gear chain.